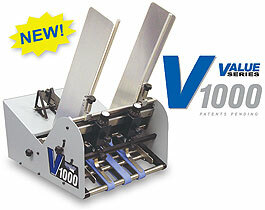 Introducing the new Streamfeeder V-1000 mailing feeder. The Streamfeeder V-1000 is the latest addition to the Value Series. The Streamfeeder V-1000 is the result of extensive research throughout the mailing industry to define what mailing service companies in the industry desire most in a continuous feeder for applications such as ink jet printing, tabbing, and labeling. The research has yielded a no-frills product that feeds a wide variety of materials with exceptional alignment qualities. The new V-1000 (patents pending) includes features that provide quick tool-less setup, quick make-ready, and easy maintenance.